In this tour we'll visit a stunning museum in the heart of Villa Borghese Gardens, a Roman "Central Park" few steps from Piazza del Popolo. 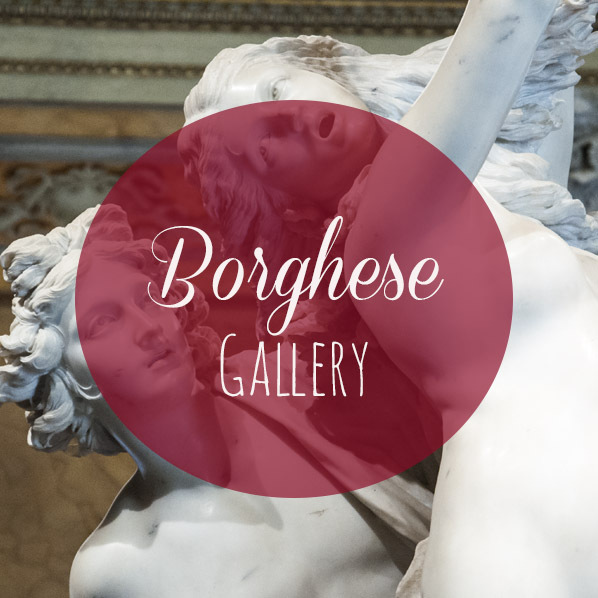 Inside a charming palace we'll discover the private art collection of Scipione Borghese the cardinal nephew of Paul V (pope between 1605-1621). The museum hosts works of important painters of the Italian Art, as Raphael or Caravaggio, or the statue of Pauline, sister of Napoleon, carved by the neo-Classical artist Canova. You'll see marble masterpieces of Bernini, the Genius of the Baroque Rome. Bernini turned tears, veins and flesh into marble as you'll see wandering around the incredible and tragic "Apollo and Daphne" or staring at "Pluto and Persephone". A slow-paced museum when you can relax and enjoy beautiful art. Meeting point: We'll meet 30 minutes before the admittance at the main entrance of the Borghese Gallery, Piazzale del Museo Borghese, 5 Details will be provided at the moment of the booking. Timing may change depending from your interest and pace. Anyway, after 2 hours we are obliged to leave the museum. - the visit is possibile only following a precise schedule. "Admission is in staggered two-hour tours with a maximum of 360 people (at the end of which you are obliged to exit the museum)." - Please travel light for this tour! Before the entrance it is mandatory to deposit any kind of bag, helmet, recording device, umbrella, stroller. - the second section of the Gallery, the Art Gallery, is at the 2nd floor of the palace. There is a long staircase to climb. If you've problems in doing steps let me know before the booking. I can take care of the reservation (20€ a head). (even in case of a tour cancellation).